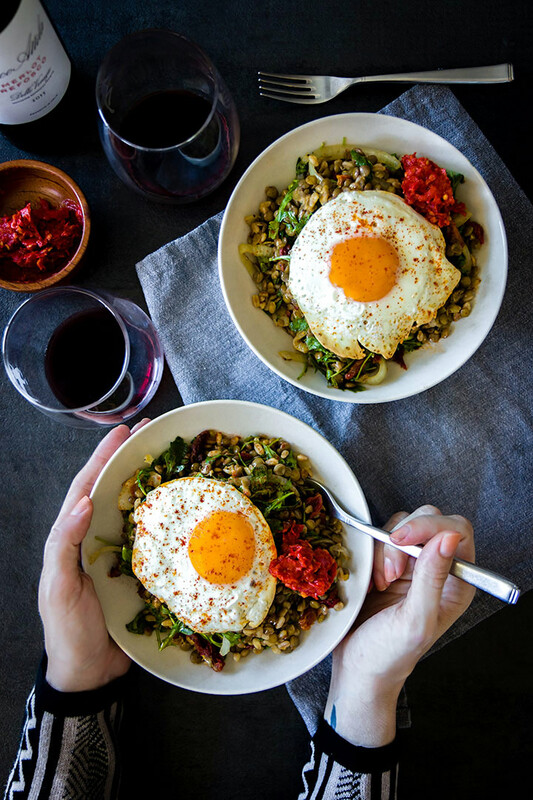 Easy Lentil Bowl with Sunny Egg & Harissa - A Versatile Weeknight Meal! 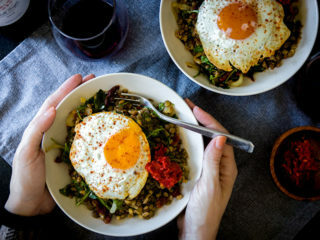 Easy Lentil Bowl with Sunny Egg & Harissa, a simple lentil bowl with farro, onion, arugula and sun dried tomatoes topped with a sunny egg and spicy harissa. Just so you know, I’m a big, BIG fan of easy. I may cook dinner 5-6 times a week, but I rarely spend more than 30-40 minutes preparing and cooking my meals (and half of that is spent scrolling through my phone while waiting for it to finish). As much as I love a big, complicated meals I just don’t have the time or the patience during the week; I want to get the most out of my (minimal) efforts and that means a meal that will stretch into lunch the next day but doesn’t sacrifice flavor. Enter the spicy lentil and grain bowl. Like I’ve mentioned many times before, I’m not a precise cook and I like a recipe that allows for variation. I have a few favorite dishes with a foundation of pasta, lentil or rice but what they’re paired with is usually determined by what is left in my fridge. Is is summer? Tomatoes, lemon and greens maybe be good additions. Fall? Butternut squash and kale may be better choices. Is it just time to clean out everything in your fridge? Throw that sh** in the pot and see what happens. It may not always be a hit, but adventuring with new ingredient combinations and flavors is sure to build your kitchen confidence. Though I may have a lazy approach to ingredient planning, I am not lackadaisical about my sauces and spices. To me the flavor combinations make the meal. Anyone can throw a chicken breast in the oven or boil pasta and add vegetables, but it’s the herbs, spices and sauces that bring a dish to life. It’s the combination of deep, musky spices liked curry and cumin with a fresh squeeze of citrus and spicy North African harissa sauce that take this dish from bland to bold (and if you didn’t already know, I like my food bold). 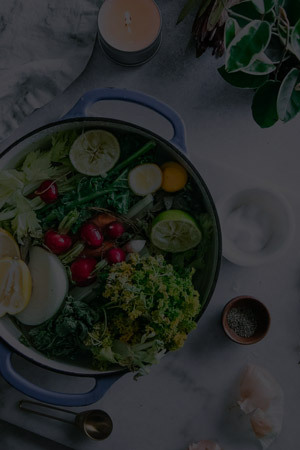 Below is the foundation formula for my favorite lentil bowl and a recipe for my most recent ingredients combinations–however, as always, you do you. First, cook farro or grain of your choice (follow package instructions) and lentil. In general, 1 cup lentils or grains needs 2 cups of water. Bring water and lentil/grains to a boil, then cover a simmer over low heat until soft, about 20 minutes. While lentils and farro is cooking, heat olive oil over medium heat in large pot or dutch oven. Add sliced onions, cooking 3-5 minutes or until beginning to soften. Stir in lentils and then add cumin, curry powder, paprika, turmeric and sun dried tomatoes. Cook 1-2 minutes more, then reduce heat to low to keep hot until grain is finished. 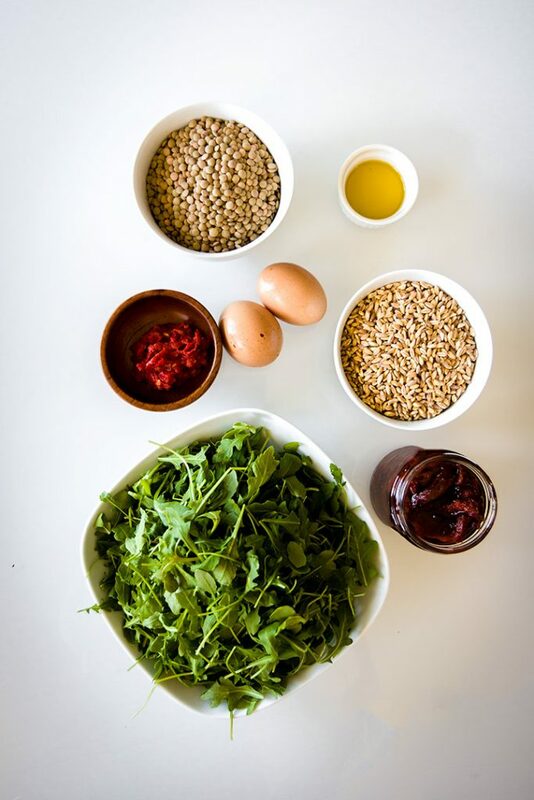 Once grain is done cooking and strained of excess water, stir in with lentils and add arugula or other leaf vegetable. Remove from heat and scoop lentil and farro mixture into bowls. Heat butter in small pan over medium heat. Add egg and heat until white is fully cooked but yolk is running (about 5 minutes). 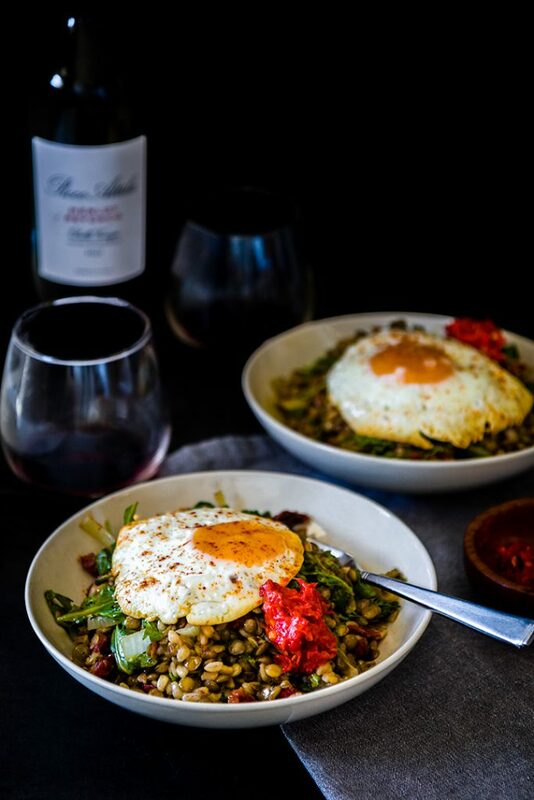 Top lentils with fried egg and 1 tbsp harissa sauce. This recipe is highly customizable, so feel free to play with spice amounts and whatever vegetables you have on hand. Leftovers & Storage: Leftover lentil mixture can be refrigerated for up to five days. Fry a new egg when heating up leftovers. 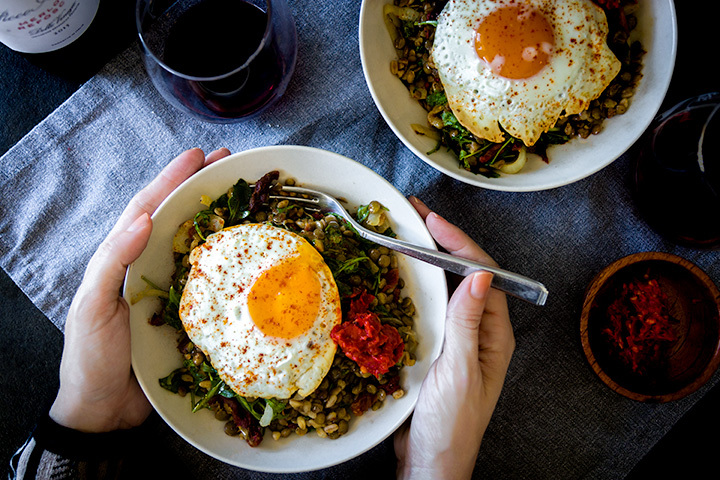 loving this easy lentil bowl with sunny egg & Harissa? Try another of my easy weeknight meals, simple dishes that are fast and easy without sacrificing flavor. Grilled Zucchini Goat Cheese Bake: it doesn’t get easier than this. Goat cheese wrapped in zucchini and baked in red sauce with bread on the side. Dinner is served! Love your pictures. Looks so delicious! Can’t wait to make this at home. I love recipes that use harissa as an ingredient. So flavorful. Thanks for sharing! I hope you like it! We make this at least once a week for dinner (in fact, we had it for dinner tonight, haha). I love harissa as well, always looking for more recipes to use it with.